This was a return to Angels for a two show day. It should have actually been the first time I’d seen it but luckily for me someone unable to use their ticket and NT Live meant this was round 3 and a chance to really take in the details. First a note, I know it’s been wall to wall Angels here and for those who follow me on social media/know me in real life. But I’ve loved this play for 14 years. I’ve researched and studied it over the course of 10 and spent nearly 4 of those studying it more forensically than anyone but probably Kushner himself and a couple of other high-end nerds. 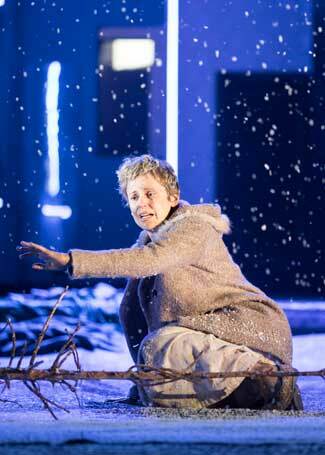 Also this production- and I’m going to reflect on this when it’s all over- has meant so much to me. Being involved in a tiny way has given me a lot, and taught me a lot. But also just having this production back at this moment has meant such a great deal. So indulge me a little while longer. The two show day is a marathon not a sprint for both audience and cast. And actually watching it again I really felt the sense of the cast starting steady, and really ramping up by the end, it’s a true experience to witness that kind of performance across a day, and a true team effort as well. And that’s what I want to start with actually. Although there’s standout performances, things that I’m now noticing, liking more, liking less. What stands out to me is the sheer force of the whole ensemble. Because people forget that this is a true ensemble piece of theatre. Each of our 8 key actors holds together the whole story. If one person is even slightly off their game the whole thing falls, and nobody drops so much as a line. More importantly as the show is well and truly into it’s run, it feels like the whole company is running at it with everything they’ve got and it still feels like new moments are being discovered. It still feels like a real conversation and -dare I say it- journey, for each of them. And that again, knowing it backwards as I do, I can be surprised by readings of a line again, is really something. For me this time it was a chance to take in the little details, having seen the big picture and thanks to the luxury of NT Live just days before, held it fresh in my mind. One of the true delights in this is the number of split-scenes, and the chance to focus my attention away from the main ‘point’. So while for example, Roy was being delivered his ‘very bad news’ I was able to observe the sweet and poignant wordless play going on stage left, between Prior and Louis- watching them, following the end of their scene proper, get ready for bed and eventually curl up asleep (or were they I believe Prior actually stays awake staring at the ceiling for the entire scene it’s these tiny details I was loving seeing). But also just how detailed the performances, and the production are really struck me. Seeing the plays side by side again cemented just how Elliot understands them as one play. has directed them- and that she really ‘gets’ the idea they are one play and two halves of a play. There are things in Millennium that simply don’t make sense direction-wise until you see Perestroika. 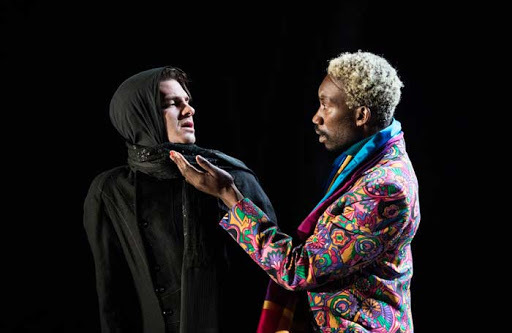 And I adore that- you wouldn’t expect in a ‘normal’ play to be able to make sense of every directorial choice by the interval, so why in this should it make sense by the end of part 1? What strikes me also is the idea that the set builds the play from the ground up alongside the direction. Even when the ‘set’ is a complete absence of set. It’s some whole picture thinking that produces some stunning visuals and some wonderful theatrical effects. It is this sense of directing one whole play that accounts for the- to steal a phase from Prior- ‘Emotional liablity’ -of the plays. By interval four, I was exhausted, emotionally spent before even the final act. It feels like being pulled along by a train that’s getting faster with each passing hour. It is also the sheer emotional investment in these characters by the end of the day. The power of Kushner’s writing has always been, for me, that we as an audience can see ourselves in all of his characters. But that also means that we go through what they go through so intimately, and this group of actors really brings us in. 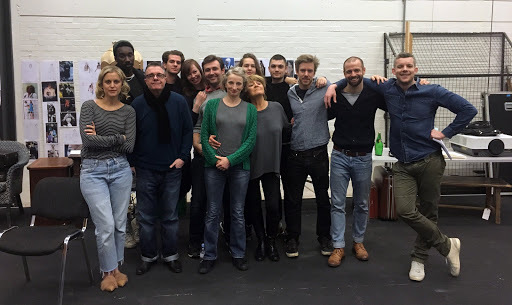 Denise Gough is a masterclass at this. It’s not news to say how good she is, but she’s so good it’s easy to miss how good she is. Her Harper is actually more prickly, more possibly dis-likable than other interpretations, but she’s so strong with it. And for women in particular perhaps, it’s the feeling of the stronger a woman is appearing the harder she’ll fall. And the power of her Harper failing to hold on feels so very real-almost any of us are just one final thing away from a flight of fancy to Antarctica. And that’s the skill of it- she isn’t the slightly odd Mormon wife who takes to many pills, she could be any of us, particularly when she falls. And fall she does, making sense of utter nonsensical ramblings, making illogical feel logical and never actually giving that much away. We don’t know exactly how Harper ends up as she is, but we will with everything we have for her to escape.Meanwhile she is charming and oh so very funny- the verging towards farcical levels in the Diorama scene with Prior let Gough show her comedic timing and skill, alongside the rest of a devastating performance. And when she escapes into her dreams I cried for her and when she finally escapes by walking out on Joe, I cried even more. It was one simple line that summed up all she did with Harper, her joyous, throwaway ‘A trip to the Moon on gossamer wings’ because actually it isn’t throwaway- Gough gives it what I’d never noticed before, the exact moment Harper knows she can leave, she will leave. And when her Harper gets on that plane to San Francisco I’ve never been more sure that she’ll be alright in the end. 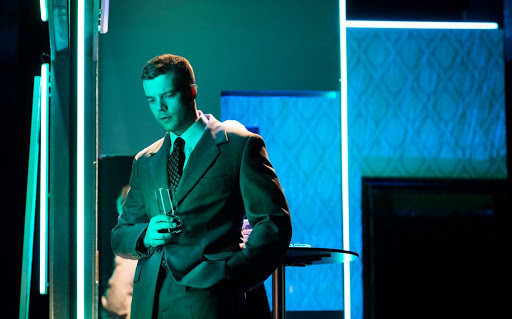 Opposite Gough, Russell Tovey also delivers new elements of Joe. While he’s still wide-eyed and puppy-dog, there’s a dark side to Joe that makes you believe Harper’s fear of him. His habit also of talking at 100 miles per hour when he gets angry gives an urgency, and a fear to his character. This dark element, and an obvious sexual tension with Roy from the outset makes Tovey’s Joe feel a much more unsettling presence and this seems to give him the power that unsettles the worlds of those lives he crosses. 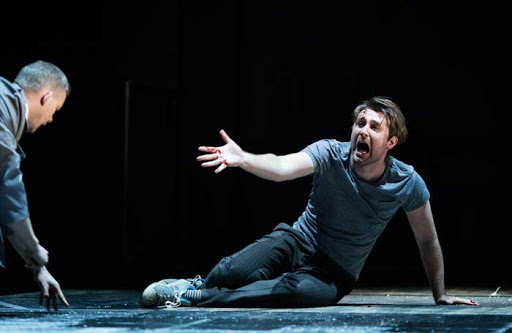 Not least that of James McArdle’s Louis, who continues to do extraordinary things with his character. The true marker of his skill being the ‘Have you no decency’ scene with Joe/Tovey in which he manages to both tear through some of Kushner’s finest political points while simultaneously tearing his heart out over Joe and his betrayals. The ‘Have you no Decency’ scene may be my favourite piece of writing not only in theatre, and McArdle here finds levels to this complex scene and gives it a new level of emotion. There are details to his Louis I noticed more- from the physical tics to the ‘Angels in America’ scene that make it more hilarious (he attempts and fails to cross his legs every time he tries and fails to conclude a point), to the vocal elements of his Louis- a stuttering hesitation that implies the whirring ridiculous nature of Louis (Kushner’s) brain as it ties itself in knots. And finally, yes, the ability to cry far too easily. But what also strikes me is the tender streak he gives Louis, underneath it all. There’s no doubling there is a real affection for Joe- despite everything Joe is or does, but above all the tender and deep affection for Prior is also really obvious, and despite the hope of the ending I felt a real melancholy for Louis (and Prior) for that loss of what they once had that I hadn’t really before. The wonder of seeing this multiple times is also being able to reflect critically on it too. For someone so invested, as much as I rave about it there were always going to be aspects that I didn’t like or at least that I say ‘I wouldn’t do that.’ And there are many- the design at times, though I get the overall shape of things (and do love how it works in Perestrokia) isn’t what I’d do. I love the bravery of the Angel even if I’m not sure she always works. Would I have cast Nathan Lane? No. Do I think someone should tell him he isn’t being ‘Max Bialystock with sandwiches’ in scene 1? Sure. 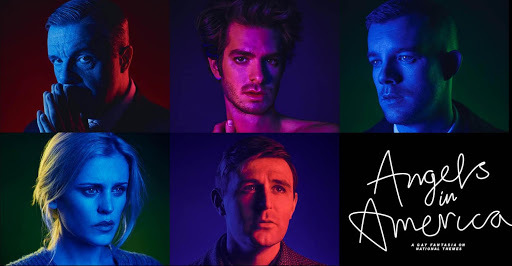 Do I occasionally want to tell Andrew Garfield to dial it back a notch? Yes. (Caveat I think he gives an outstanding performance but I want Prior’s cracks to show a little more than he lets them). 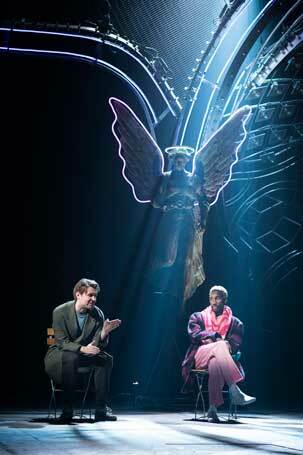 Do I think Angels can be done with 8 actors and a chair rather than everything the Lyttleton can do? Yes. But you know what I know Marianne Elliot knows that too. And I want to bloody well applaud, high five and hug her for doing it exactly this way. Because it doesn’t matter that I wouldn’t do it this way it matters that she did. That someone for what is essentially an anniversary production came in and threw out the HBO production, threw out the original production and said ‘What can we do?’ I don’t have to love every choice made in this production to be glad it was made. And fascinated by them all in equal measure. 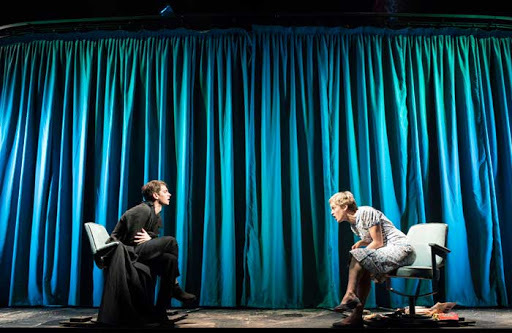 And what this production has done for me intellectually (emotionally, personally is it’s own post I’ll get to after it closes), is make me think about the play afresh- and isn’t that what a revival should do? I’ve re-thought the politics in detail- granted nobody when this revival was commissioned could know just how relevant parallels with the Reagan Era would be. But I’ve considered how Kushner’s small-p politics should be considered. I’ve thought about religious imagery again seeing this new incarnation of the Angel. Questions of morality, of loyalty, of friendship and love over politics seem to be thrashed out fresh. That’s the joy of revival. The ‘Magic of the theatre’ as Harper says. Another element for me, knowing it too well, is thinking about these characters again. Roy, it pains me to say, becomes more real than his previous ‘footnote in history’. I consider Belize differently with more experience of the world, knowledge of racism in America. I look at Louis and Prior, now the same age as me and consider what they go through. The marker of a truly great play- it grows with you. I said above that I thought about Harper being ok after the end of the play. And this production more than any time previously has made me think about what happens to the characters after the play. Perhaps that’s a marker of how real they are. I had an in-depth conversation about how Louis and Prior met, I considered more how Harper had come to end up with Joe, her miscarriage, Hannah’s family and what becomes of them all at the end of the play. And interestingly this production has shifted my thoughts slightly- to a much more hopeful one. I’d always been fairly negative about Prior’s future, but it is actually such a hopeful production I’ve come to revise that, finding myself thinking ‘I bet he does live for years, I bet he’s still alive’. 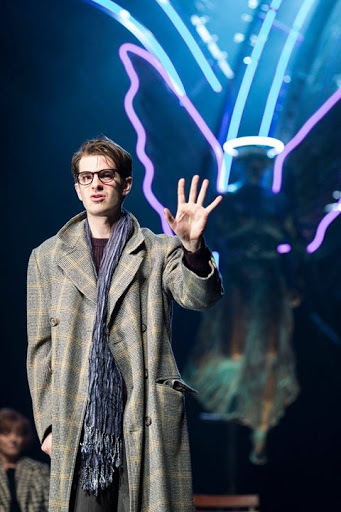 And that’s what I’ve noticed about Elliot’s production, it’s hopeful. As Garfield steps forward to deliever that final Epilogue, the house lights of the Lyttleton rise (in a genius, devestating move, thanks Marianne…) I defy anyone not to be overwhelmed by that sense of, yes there is hope. It is also incidentally the scene in which Garfield is at the height of his powers- a sense of growing into this final incarnation of Prior across the near 8 hours, and emodiying the theatrical responsiblity that rests on that scene. And so he delivers the audience, that if in defiance of everything- of going to hell and back (well heaven) Prior can declare ‘The world only spins forward’ then maybe, an audience can too go out there and keep going. Keep hoping. For as Kushner also says; ‘There is an ethical obligation to hope’. Angels is at the heart of it a very traditional theatrical lesson. One that Prior addresses to us at the close, and we are sent, back into the world after being immersed in theirs with the most simple of instructions ‘More life’ but with ‘more life’ as Prior says ‘The Great Work Begins’. It’s deceptively simple after those 8 hours, but the heart of it has always been simply humanity, and the resolve to keep going. It’s at once deceptively simple and utterly devestating.